"Honeydew" is in fact the American name for the White Antibes cultivar which has been grown for many years in southern France and Algeria. 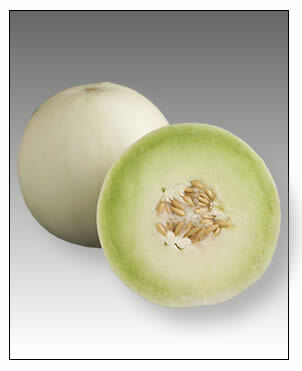 In China, honeydews are known as the Bailan melon. Honeydew's thick, juicy, sweet flesh is often eaten for dessert, and is commonly found in supermarkets across the world. This fruit grows best in semiarid climates and is harvested based on maturity, not size. Maturity can be hard to judge, but is based upon ground color ranging from greenish white (immature) to creamy yellow (mature). Quality is also determined by the honeydew having a nearly spherical shape with a surface free of scars or defects. Also, a honeydew should feel heavy for its size and have a waxy (not fuzzy) surface.